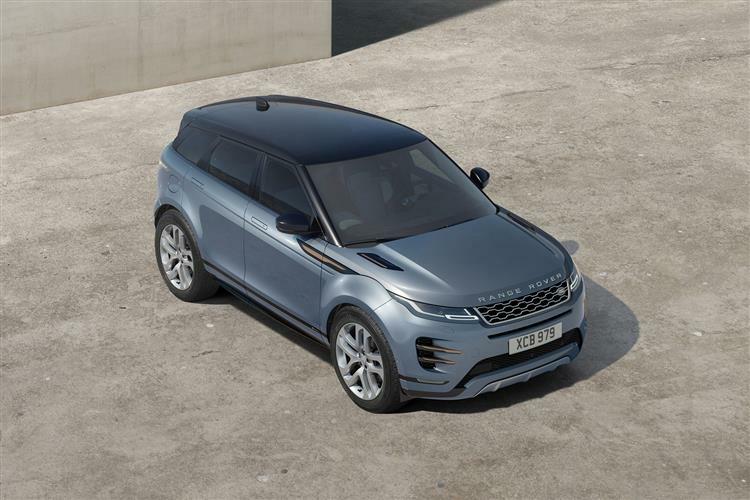 The all new 2019 Range Rover Evoque is here and we have some top lease deals for you. It's a great SUV for driving round town or even off the beaten track. The Evqoue has a new fresh look, a lush cabin and lots of high tech features. Due to the new release, we have some really cheap prices. The best offers are presently on the D150, D180 and P250. Please contact us for more info and upgrade options. The all new 2019 Range Rover Evoque is here! If you are looking to lease a stylish, small SUV this is the car for you. As well as stunning looks, it's got a lush interior with lots of high tech features. On first impressions you may think the Evoque looks the same as the old model. Especially if looking at it from the side, but they only share the same door hinges. Looking at it from the front you'll notice the fresher look right away. You may also notice the new headlights are similar to the Velar. That's because they are actually the same headlights. Yes, it does look similar to the older model from the outside, but the new cabin is fantastic. There's a whole host of high tech features that will make you love driving your new Evoque. The top spec Evoque gets 3 infotainment displays. Yes, 3! As well as a digital driver display you get one with the sole purpose to control ventilation & heat. The system is simple to use and is really impressive overall. The system can learn how hot you'd like the cabin and how you want to position your seat. You will need to go for a higher spec for these options however. Standard specs are still fab though. You get mood lighting and a 10" screen. The Evoque comes with a choice of 3 petrol engines and 3 diesel engines. Depending on the model you lease, you can have front or 4 wheel drive as well as a manual or auto gearbox. It now comes with 5 doors as standard. It also comes with a range of cool aids to help you drive off road. The Terrain 2 system makes it super easy to set the Evoque up for driving off road. It includes a number of helpful presets. Whether you're looking for a SUV for town driving, or to drive off the beaten track, it's a great choice. It's a super easy car to drive due to the light steering and overall lots of fun. You get a really nice view out when driving due to the big windscreen and raised body. This really helps if you're driving around town or more built up areas. If you drive round town regularly, it may be worth getting the Clearsight Ground View camera. This makes driving through tighter spaces such as width restrictors a doddle. The Evoque is nice and smooth when you get out on to a motorway. It's fairly quiet when driving at speed too. Along with the steering, the suspension is really impressive. It feels really nimble to drive and all models (aside from the D150) come with 4 wheel drive as standard. On to lease prices. At present, the cheapest model is the D150 at £287.32pm (business) and £323.68pm (personal). If you're looking for something a bit faster, take a look at the D180. That's also quite cheap at the moment due to being on offer. You can lease one for £386.17pm (personal) and £321.81pm (business). Prices correct as of 12/04/2019 (subject to change). Boot Space (Seats Down) = 1156 litres. Boot Space (Seats Up) = 472 litres. Turning Radius = 11.6 metres. The new Range Rover Evoque is really easy to get into. This is due to the raised suspension. It has a tall roof which means you get lots of headroom in the front of the car. We love the adjustable steering wheel and 8 way adjustable front seats. As a result, it's really easy to find the best seating and driving position. Whilst the previous version was a bit tight in the back, the new model doesn't have the same issue. There is much more room on offer. Taller passengers shouldn't have any issues with knee space or headroom. Although the rear central seat is raised, there's plenty of space in the back to carry 3 adult passengers. If you have 3 children, they will all be really comfortable. It's easy to fit a child seat as well. With the seats up the Evoque has around 472 litres of boot space. It's more than you would get in a rival SUV's such as the Volvo XC40. But other rival cars such as the Audi Q3 and BMW X1 have bigger boots. Loading heavier items into the Evoque is easy due to having no boot lip and a fairly wide space. If you were going on holiday, you would have no issue fitting a push chair and some suit cases in. In addition, there is some hidden storage under the floor of the boot. This will be enough space for a couple of small bags. Folding the seats down will increase the Evoques boot space to 1156 litres. This would give you plenty of space for a bike. The boot features shopping hooks and tethers to stop your luggage from moving around. The 12v socket will come in handy when you want to vacuum out the boot. The 4 bins in the doors are plenty big enough to hold a few small bottles. There is some extra space under the central armrest. In addition, there are some USB ports and a 12v socket. There's a total of 4 cup holders. Two in the front just behind the gear selector and two which are built into the rear armrest.